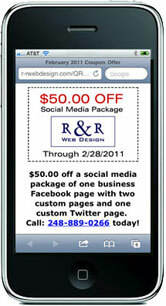 Here is a real example of an actual QR Code Coupon from R & R Web Design LLC. If you have a smart phone with a camera and QR code scanner, scan the coupon code to the left to reveal the coupon offer. Imagine the possibilities that QR Codes will bring to open new channels to market your business. From daily or monthly coupon offers, to contests and giveaways, QR Codes are a phenomenal way to market your business or organization in the growing world of mobile marketing. How does a QR code scanner work? QR code scanners take a picture of the code with a Smartphone that has a QR code scanner. Below is a visual illustration of an iPhone scanning the coupon code above. Many smartphones come with a QR code reader already installed. If you do not have a QR code scanner, there are a number of free QR Code readers available online for a wide variety of Smartphones. 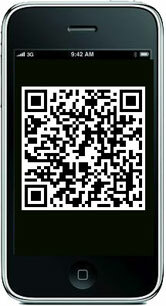 You will need to install a QR Code reader on your Smartphone to read the code. QuickMark Mobile Barcode Reader. This reader supports 46 mobile brands including the iPhone and Android. In our tests, QuickMark was one of the easiest cell phone barcode readers to use. To use it, simply open the app, point your camera at the barcode and QuickMark will automatically scans the code. A number of Smartphones are supported. After installation of the QR Reader of choice, open the scanner and use your phone’s camera to click and scan our QR code above with your new QR Code reader. Let us know what you think. Do you have a favorite QR code reader? we believe that QR codes will make the connection between offline and online worlds easier. That’s why we created our QR code generator with social features – YouScan.me. You can add all your info like Facebook profile or fan page, twitter, youtube, etc. and connect with others. Nice article. 2011 will be the year of the QR code! Next time you make a qr code, try Social QR code. 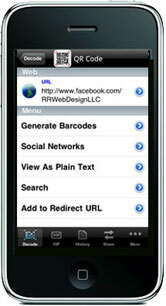 it is designed for businesses to promote their social networks with QR codes. You can also create mobile coupons that are sharable on twitter and Facebook. Please give it a try! 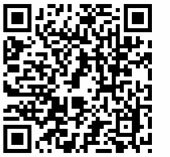 Hi, you should mention Lynkee QR reader, the best IMO (I own the new version on my iPhone 4G…it’s huge). Great blog, lots of cool posts on here.